The Algarve is the 2nd cheapest European resort for travelers, an analysis of 20 seaside holiday destinations reveals. In first place, comes Bulgaria followed closely by Portugal’s Algarve and in 3rd place was Turkey, the UK’s Post Office Travel Money said. The survey looks at the costs of several typical expenses that the average tourist will encounter, including lunch and evening meals, drinks, etc. The most expensive destination was Sorrento in Italy, where prices were three times more expensive than the survey leaders…ouch! The survey concludes that these whilst any result is affected by the strength of sterling against the euro it is better than it was 12 months ago. The real reduction in costs are due to competitive pricing in restaurants, bars and shops by as much as a third in some resorts. The survey reflects what costs to expect in various resorts but not the quality of service, food or products bought there. Cheap is not always least just as expensive is not always best. I can speak personally for the Algarve and as many tourist will agree, quality has and still does rate very highly here whilst still being the 2nd cheapest destination in Europe. So the Algarve comes out tops for value for money notwithstanding favourable weather for 12 months of the year not just the season and has the most frequent flights in and out compared to its close competitors. But what about Brexit and the Algarve and Portugal? Brexit means Brelcome, well at least it does in Portugal! “Brelcome, Portugal will never leave you” affirms new tourism campaign aimed at the British. Author canbriporPosted on April 6, 2019 April 6, 2019 Categories Algarve and PortugalTags Algarve, Brelcome, Brexit, Holidays in Europe, PortugalLeave a comment on Algarve is the 2nd Cheapest European Resort for Travelers and Brexit Proof! From either the EN125 or the A22 you will find an intersection with the EN266 just north of the coastal city of Portimao. Following this road you will pass through Rasmalho (Stork City), one of the largest colonies of White Storks in Portugal. You will be gradually climbing the wooded foothills of the Serra and will come across a famous Spa village, Caldas de Monchique, turn off here and walk this tiny but fascinating village, you may get to see bread being made in the communal ovens, walk the shaded pathways to the thermal streams, or indulge in rituals at the spa itself. Continue upwards to the town of Monchique, cobbled streets and artisan shops, a ruined convent and wonderful gardens are well worth a visit. Monchique is famous for it’s cork oak forests, wild boar and black pork cuisine, if you intend to eat out in the Algarve then Monchique would be a great choice. From the town centre continue upwards along the EN266-3 to Foia, the highest point in the Algarve at 902m above sea level. Here you will have spectacular 360 deg views. An unforgettable experience. You can retrace your steps to Monchique or take any of two other roads that descend, one to the east and one to the north, both will bring you back town. There is a gorgeous contour drive that you can take from Monchique: Head to the roundabout that you first encountered when you arrived at Monchique, next to the petrol stations, and take the exit marked Alferce EN267. Take a right 20 meters (literally) after entering this road, which goes behind the bar on the corner, (local labour exchange). You are now on the contour road that circumnavigates the smaller mountain of Picota. Again the coastal views are spectacular, you will also look down on the Oudelouca dam wall. Stay on this road until you hit a T junction, turn left in the direction of Alferce. Take a drive through the village, just a typical sleepy mountain village where sleeping dogs will not raise an eyebrow as you pass by. Follow signs back to Monchique. Leave Monchique by the way you came on the EN266, if you still have a few hours, at Porto de Lagos roundabout turn left on the EN124 in the direction of Silves. You can have a taste of this historic walled town with Moorish castle, archaeological museum and Roman bridge, though this could be a full half day trip in its own right. The Algarve West Coast. Some of the best coastal scenery in Europe awaits you here, pristine, deserted beaches and rugged cliffs will captivate you. Fishing villages, deserted beaches, rugged cliffs and views, views and more views! Some of the best coastal scenery in Europe awaits you here, pristine, deserted beaches and rugged cliffs will captivate you. Take the A22 or EN125 to Lagos, Lagos is a day trip all on its own so don’t include it on this itinerary there is simply not the time. Continue west along the EN125. At Vale Verde turn left on the EN537 to visit Praia da Luz and Burgau. Don’t turn north at Burgau keep going west along a much smaller coast road to Salema. These are all small fishing villages that are popular but not swamped with tourism. Great fish restaurants in all of them. Head north again until you hit the EN125 again and head west in the direction of Villa do Bispo and Sagres. You will notice that the landscape has changed drastically, very few trees and quite windswept, not unlike Cornwall in the UK, for much the same reason. At Sagres visit the Fortaleza de Sagres and the Cabo de Sao Vicente light house. The cliffs here are spectacular albeit dangerous, don’t go too close to the edge! You are also at the most South Western corner of Europe. Retrace your steps to Vila do Bispo and find the north west corner of the village near the market, head out on the M1265 to Praia do Castelejo, this is one of the best unspoiled beaches in the Algarve, if not Portugal. Back to Vila do Bispo and then head north on the EN268. There are about a dozen small tracks that head west off this road to some spectacular and remote beaches, each about 4kms long, you may need a 2nd day to try some of these. Head north and (don’t miss this section), just 2-30 meters before the quaint village of Carrapateira there is a turn to the left that goes south west to Praia do Amado and from here a wonderful cliff top road that runs north, don’t take a right turn to Carrapateira but continue along the cliff road. There are some great cliff top board walks you can go on. Eventually this road will look down on Praia do Bordeira which is a kite surfers paradise and end up back on the EN268. Head north again. The EN268 will join the EN120 continue north in the direction of Aljezur which is an old village to explore with a castle and some excellent traditional restaurants. Drive through the narrow streets and keep going uphill to the castle (to save your legs). A few kms before Aljezur you will have passed a turning to the coast, if you have time, track-back and take the M1003-1 to Praia da Arrifana, a surfers haven with stunning scenery, fishing harbour and a small fort that was badly damaged by a tsunami in 1755 which stands atop a 200 foot cliff, yes a tsunami, seriously. At this point you can turn back on the EN120 to Lagos about an hours drive. Or from Aljezur take the EN267 in an easterly direction towards Monchique. This is a delightful route via the village of Marmelete and then along a contour road to the EN266 just south of Monchique, turn right in the direction of Portimao, this route will take about one hour 15 minutes. Author canbriporPosted on March 2, 2019 March 14, 2019 Categories Algarve and Portugal, Algarve Road TripsTags Algarve, Algarve Road Trips, Aljezur, Burgau, Carrapateira, Fishing villages, Holidays, Lagos, Monchique, Portugal, Praia da Luz, Praia do Castelejo, road trips, Sagres, Salema, Seafood, weather, West coastLeave a comment on Algarve West Coast Road Trip. The Portuguese real estate market should “remain dynamic over the next few years! Strong national and international demand for property coupled with a housing shortage have put Portugal on track for a forecast 9.5 percent rise in property prices this year, which means Portugal, along with Ireland, will be the European country with the sharpest increase in real estate prices, among the 10 countries analysed by the US financial rating agency S&P. This forecast, according to a piece by business and economy site Economia Online, is made in the ‘Europe’s Housing Market’ report published on Monday by S&P. In the report, the agency analyses real estate price developments in Belgium, France, Germany, Ireland, Italy, the Netherlands, Portugal, Spain, Switzerland and the United Kingdom. S&P predicts only in the UK will prices remain unchanged this year, with increases in all other cases; up until 2021, Portugal will remain among the countries with the highest increases. As a result of strong demand, both domestic and international, and supply shortages, prices are expected to increase by 9.5 percent this year, slowing down to seven percent in 2019, six percent in 2020 and 5 percent in 2021. This, after last year, having already increased by 10.5 percent, and another 7.7 percent in 2016. Nonetheless, S&P believes that the Portuguese market “remains affordable”, with “a price-earnings ratio still seven percent below the long-term average”. In any case, S&P points out, “limited supply coupled with strong domestic and external demand is fuelling house price inflation”. Bolstering this demand is “robust economic growth, job creation and low interest rates” as well as falling unemployment and “special incentives” such as the granting of gold visas and the programme for non-residents. In this context, the agency anticipates that Portugal’s economic growth will remain “solid” this year, despite a slowdown compared to 2017, pointing to an increase of 2.3 percent of GDP. Thus, the Portuguese real estate market should “remain dynamic over the next few years, supported by job creation and increased incomes, as well as by external demand”, S&P concluded. The gap between supply and demand is also expected to continue over the next few years. 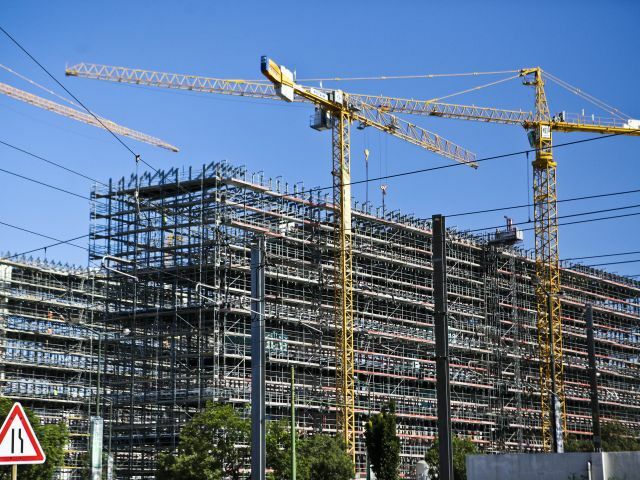 This is because the number of properties under construction is increasing, but still small, so it will likely not keep pace with the growth of demand.